Brownies on they’re own are simply delicious! A cheesecake layer in between means you can’t go wrong! White chocolate chips in the Cheesecake layer make them even better! 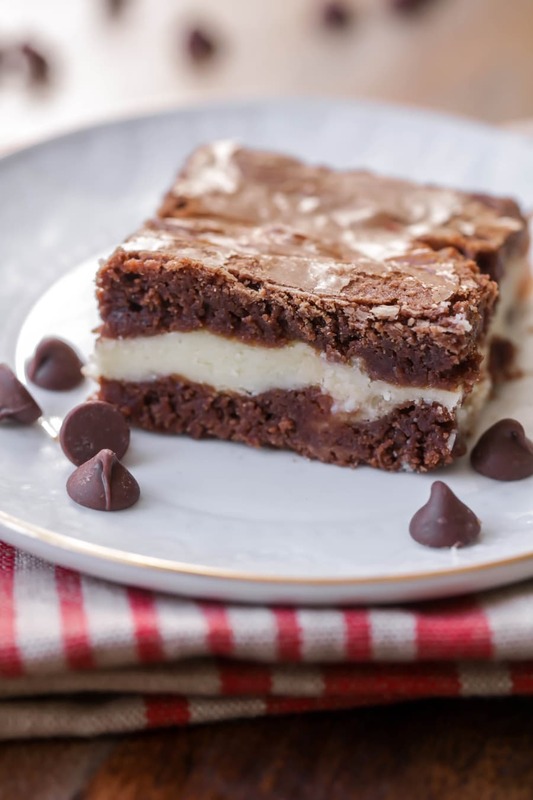 Um – yeah… cheesecake brownies (aka cream cheese brownies) are delicious! I admit that I usually serve ice cream with traditional brownies, but these guys are great on their own!! And can we all admit everything is better with cream cheese?!! Umm… these look beyond amazing. Thanks for the share! will definitely have to try in the very near future. Thank you Kristyn. Have a great weekend! I made these brownies today!!! They are Amazing!!! Thank you so much for sharing the recipe! It’s a keeper forever and ever. These look amazing, but I hate the taste and mouth feel of “white chocolate”. Would the recipe work if they were omitted? I’m the same way. I wonder if you melted the white chocolate chips and added it would work? That way you’d get the taste but not the “feel” of them? ? I’m going to try that. Do I have to use white chocolate chips? These look incredible. I’m thinking of making them for Thanksgiving dinner, but would have to make them two days in advance. Do you think they’d keep well? Should I refrigerate them? Thanks! These taste great! And you’re right, no ice cream needed! These look delicious! I’d love to try them, quick question though: I’m in England and we don’t have all-purpose flour. Do you know if I should use plain or self raising? All-purpose flour is the same as plain flour. Self-rising flour is plain flour with baking soda and salt added to it to help your baked goods rise; however, you wouldn’t want to use it here because there are already both of those ingredients in the recipe and you don’t want to double up! Self -rising flour should not be substituted for all-purpose or plain flour as it will change the chemistry (and therefore the results) of what you are baking, but if a recipe calls for it and you don’t have any you can make your own by adding 1 1/2 teaspoons baking powder and 1/4 teaspoon salt to 1 cup of all-purpose/plain flour. Hope this helps! Followed the recipe exactly as written. After 30 minute in a 350 oven the brownies were very under baked. Did 5 min increments longer for 15 min. Still not done in middle or edges. Put temperature up to 400 and baked for 20 more minutes at 5 minute increments. Something is drastically wrong with the recipe as posted! I, too, followed the recipe and my brownies were way undercooked. I cooked them for another 20 minutes past the original 30 minutes but they were still undercooked. I don’t think my oven is off but is 350 correct? Had my oven checked and it is ok. So what is wrong with the recipe? I also tried the recipe following exactly and going on an hour now and still not done. Frustrating when recipes are wrong. Agreed!! Did not cook in the middle after one hour!! Same with me!!! Especially embarrassing because they weren’t nearly done in time for me to leave for a dinner party… so I was late, and then I had to ask the hostess to continue cooking them in her oven. And they still continued to take forever to finish baking. Very odd. I had the same issue last night. I was making these for a co-worker and they didn’t turn out the way I had hoped they would. I baked them for almost an hour at 350. They were incredibly dense and even though I buttered the dish they still stuck to the bottom. I’m going to remake at some point and use semi-sweet chips. I may also try increasing the oven temp to 375. 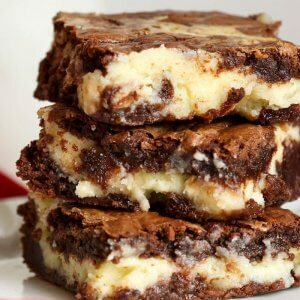 Hey Cute Kristyn, I’m so excited that you shared this cheesecake brownie recipe. It’s my favorite thing at Kneaders & I’ve been looking for a recipe. Thank you! 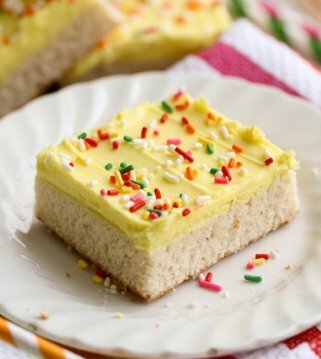 I see this is a post from nearly a year ago but I found this recipe on Pinterest recently. A coworker asked if I could bake brownies for her daughter’s Girl Scout brownie bake-off competition since she’s not a baker. I enjoy baking so I committed to finding a good brownie recipe for her daughter. I have made this recipe about three times in the last week. They are that good! The first time was a test, second time was for my household since we all loved them the first time and the third time was for my coworker. I also had a friend of mine try one of these brownies and she said: I wish I had more of this. The only thing I changed was adding a teaspoon of vanilla extract to the cheesecake batter. Such a delicious and rich recipe! the brownies were so soft. I noticed that baking them for the 30 minutes in my oven was the perfect amount of time. 27 minutes lead to slightly undercooked brownies. Again, a five star recipe! THANK YOU! This will be a keeper for sure. On my computer, the quantity for the flour just looks like a box. Could you please fill me in on how many cups of flour? Thanks! Can’t you carefully melt the butter & chips in the microwave? Yes, you can. Just make sure you stir maybe half way through, so it doesn’t burn. Sorry to respond so late! There isn’t milk in this recipe, just milk chocolate chips, as opposed to semi sweet chips. Hope that helps! Made these tonight and ours turned out more like cake then gooey brownie. Any suggestions? It is baking powder. I was just meaning to make sure your baking ingredients are fresh. Sometimes, as they get old, they make a difference in how things turn out. I am also having trouvle with the bake time. I’ve already done 30 minutes and still very underdone. I’m very frustrated. I’m sorry you are having trouble:( All ovens are different, so you may just have to cook a little longer than the 30 minutes. Just keep an eye on them and check them every couple of min. Hope that helps! 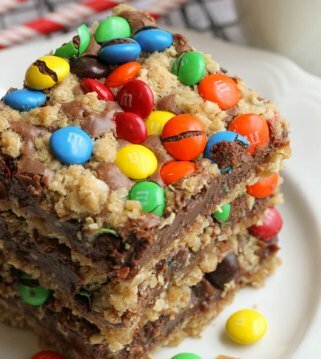 I want to make these brownies but I don’t see in the recipe when I have to use THE white chocolate? It’s in step 2:) Hope you like them!! Hey I just made this recipe and my brownies came out cake like. Should I put less flour? 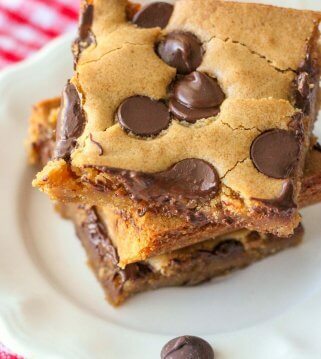 I know when I usually make brownies I put 1/4 cup of flour, should I try this ? Should I put the brownies in the fridge after to let cool? 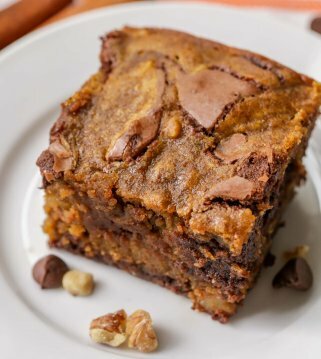 The cheesecake brownie recipe is fantastic!! I made it a week ago, and everyone loved it. Thank you! I had to convert the oven temp (175 c) to suit Australian standards, and it took about 45 mins to bake in a rectangle brownie bake tin. (For any Aussies out there). Great!! Thank you so much for sharing!! I’m so glad it was a hit! Just made these last night for a co-worker and it was a hit. Probably the best brownies I’ve ever had in my life. Definitely will be highlighting these in my blog cause everyone must try these! Thank you! Thank you for letting me know 🙂 I’m glad they were a hit! I made this for my friend’s birthday and everyone couldn’t get enough of it! Great recipe, this one’s a keeper. Thanks so much for letting me know!! Glad it was a hit! Should they be stored in the fridge.? They don’t need to be. They are fine in the pan, as long as you have a lid or cover them. You could even put them in a air tight container. Hope that helps! I tried The recipe and it was amazing!! Easy, quick and delicious. Thank you very much! 🙂 Thank you for letting me know and for trying this recipe!! These recipes are just great I love going over them over and over again. You’re too nice! 🙂 Thanks for keep coming back!! So for anyone who, like me, thought; ick I don’t want to melt the chocolate and make the brownies from scratch. I’ll just use a box mix and use the filling too…this does NOT work and should not be attempted. Lol but the results were still yummy, if messier than intended. LOL!! Thanks for sharing that!! So, glad they turned out and you liked them!! Ovens are all different, so cooking times will vary. Thank you for letting me know!! Well, it’s baked in a 9×9, so you can get maybe 12-15 depending on the size you cut them. Hope that helps!! Thanks! Made it. Ate it. Went to a VERY happy place. Flippen delicious and easy to make! I made the brownies and it is very good but I had problems with the time it cooked. I looked at the other comments and saw they had the same problem of how long it had to cook. I saw that you say to use 2/3cup of flour but I used 1/2 cup of flour instead and it was gluten free flour . I also thought I was cooking for and extra 20 minutes before find out that I turn off the oven for that 20 minutes and it got firmer but a little undone which will make it goeyness I like it goey tyvm for the recipe will do it again but the rite amount flour but gluten free flour instead. HAPPY BAKING U ALL PRAISE JAH. Ooo yes I forgot to mention that I also used flaxseed for the eggs with the gluten free flour. Next time I will be adding vanilla in the cheesecake part and I forgot to swirl it . But I did swirl it at the last 20 minutes it set in the oven so many mistakes I made and it still turned out gr8. I forgot to tell you that I made 2 more changes I used stevia for the sweetner and I add 1/4 cup of coconut palms sugar to each the chocolate and the cheesecake. Because u have to use sugar for recipes to have moisture in it I’m a diebetic I cannot have regular sugar so I used the organic brown sugar coconut palms sugar I hope this help someone who is gluten free egg free sugar free and low carb diet like me. Oh my god yes!! I’ve been looking for a recipe to bake for my boyfriend and I think this is the winner. Question though: are the white chocolate chips mandatory? They’re kind of hard to find where i am. Thank you! Sorry, they are hard to find! I personally haven’t made them without the white chips, so I wish I could let you know how they turn out without them. Where exactly are you? These look amazing! I’m going to try making them this week. Quick question. 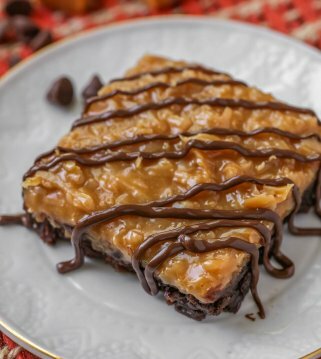 Can I double this recipe and use a 9×13 pan? Would the baking temp & time change? Yes, put them in a 9×13. You won’t need to change the baking temp, but the time shouldn’t be as long. I would just start checking them around 18-20 minutes. Then, add a minute each time. Keep an eye on them. I haven’t doubled the recipe, so I wish I knew the exact time. Enjoy!! Sorry one more question! Are vanilla chips different than white chocolate chips? Yes, they are. White chocolate verses vanilla. They are similar, but vanilla is my next best choice, if I can’t find white chocolate. Do these need to be refrigerated or just stored in a container on the counter? 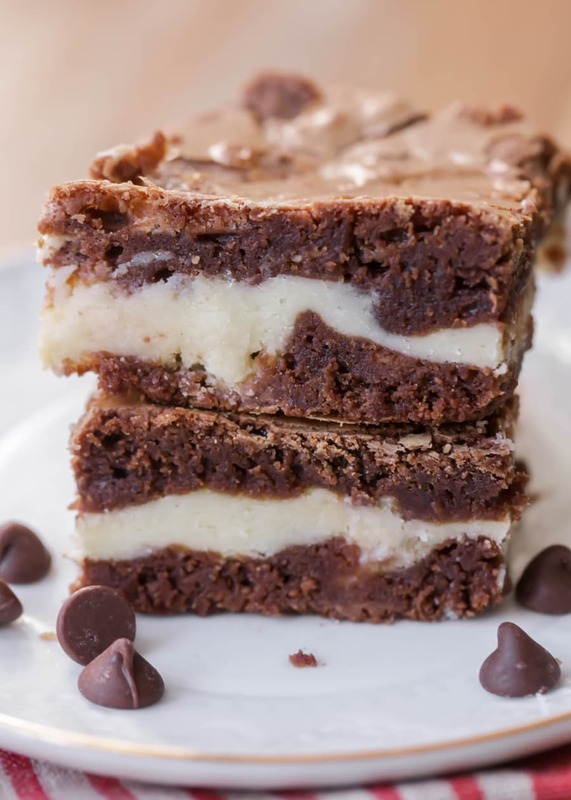 I have a question how can we turn this cheesecake brownie into an Oreo cheesecake brownie? 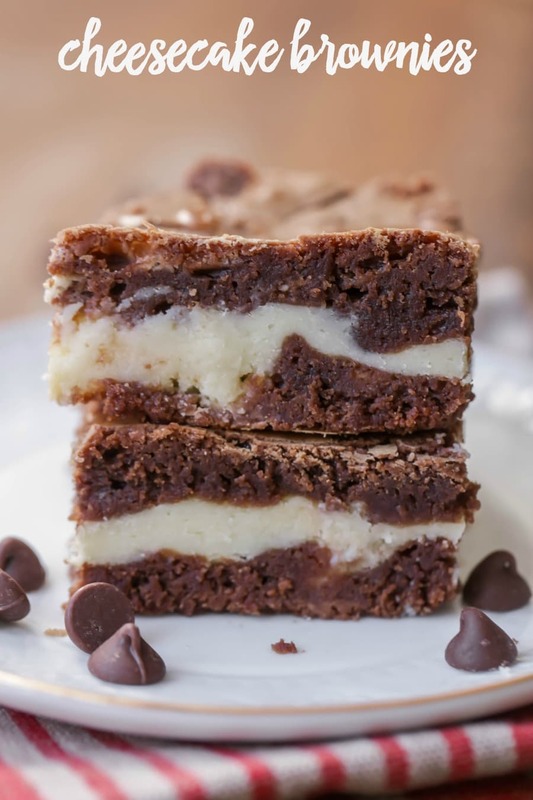 I’ve made this and it was amazing but I do have one question; how can we turn this cheesecake brownie recipe into an Oreo cheesecake brownie? Please and thank you. These brownies were AMAZING!! My new favorite recipe!! Aren’t they delicious?! Thanks so much for trying them out! I just made these today, and they are delicious!! Like some other commenters, I am not a fan of white chocolate. But I think recipes should be tried as written before they are personalized, so I put them in, and I was not sorry! The only change I made was using gluten free flour, and they turned out just great. These look great! I haven’t tried making this with white chocolate, need to remedy that ASAP. I only have an 8×8 pan. Will. this work if I just increase my cook time? Wow! 🙂 These were delicious! I suspected as much and doubled up the recipe from the getgo. A small change – I added a bit less sugar, and some vanilla and lemon juice to the cheesecake layer. Felt like the lemon would be great to break the sweetness a bit – and I was right 🙂 The brownie layer was a tad dry, but it may just be that I baked them for a bit too long. I suspect I poked a chocolate chip and mistakenly thought they were undercooked. But the moistness of the cheesecake layer balanced it out and the result was still fantastic. Thanks for the recipe! You are so welcome!! Thank you for giving it a try! I am glad you liked them! These are the best kind of brownies that I have ever made. I make them on special occasions and people love them. I agree!! They are always a hit! I’m not sure where can I buy chocolate chips around, so can I use just melted chocolate instead? Is there a difference? That will make a difference, though I haven’t personally tried. Do you have a local grocery store that has them? Thank you so much for this recipe! I don’t like brownies At all but these were delicious. 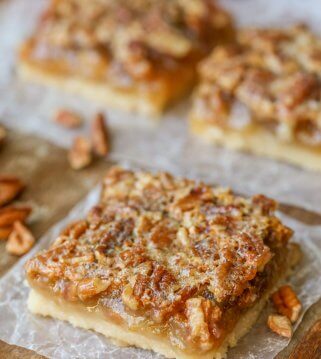 They were a huge hit with my family and I’ve made this 3 times so far in the past month. Super easy and tastes amazing and the best thing it not out of a box! Yay!! I am so glad you liked them!! Love to hear that. Thank you! The brownies turned out well and were very tasty. Instead of white chocolate chips I used chunks the children loved them. My chocolate batter was quite thick, I think the chocolate seized, I added some milk to make the mixture spreadable. The brownies were a bit cakey but we all enjoyed. Saving the recipe and will definitely make next time. Sounds perfect! Thank you for sharing them!